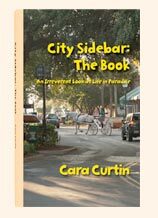 "Cara and her 'City Sidebar' unmask the extraordinary lurking behind the ordinary-and leave me laughing all the way." "Local readers and those who visit will enjoy the many references to familiar places on the island, the historic anecdotes and the well-developed sense of place." Captain Wilson’s fifth adventure, begun by the late David Tuttle, is Wilson’s most dangerous yet, and it takes the combined efforts of his entire team to extricate him from two sets of bad guys — a fed and a fanatic bent on mass destruction. When Cara Curtin took up the tale, she discovered that the team is distracted from saving its captain by pregnancies, too much local history, and a very important anniversary celebration. To complicate things further, a scary group has taken over one of the town’s stately homes. 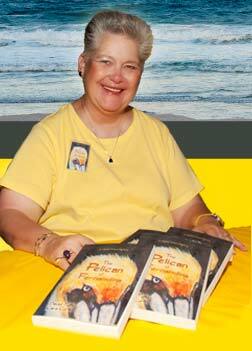 As always, the Pelican watches it all to help when he can—and pick up the pieces when he can’t. 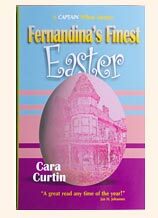 "An outrageous plot featuring Cara's trademark humor... if you like a touch of whimsy with your direst, deadliest mysteries, 'Fernandina's Finest Easter' fills the bill." In the fourth book of the series, authored by Cara Curtin, Sue Nell Borden finds a Labrador puppy on her porch one Easter morning. When the local veterinarian discovers the pup’s amazing secret, he realizes it’s going to take both him and the dog, as well as some sleuthing by “Fernandina’s Finest,” to save Sue Nell from a web of danger. 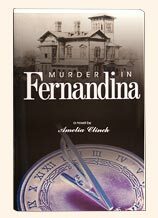 "Murder in Fernandina is a good little read with a 'gotcha' storyline and an extra-special sense of place. The combined authors have done a credible job of telling an intriguing tale in the most interesting of locales. The new detective's hard work and clever forensic investigation on the murder case pay off in the end, both for the case and for the reader. Don't miss this book!!!" 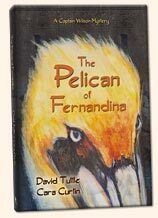 Co-authors Tuttle and Curtin plotted this third adventure while they were busy working on the lieutenant’s second one. This time, Wilson discovers that the bad guys are using the Fernandina Beach Municipal Airport in their skullduggery and Dianne, now a police officer, discovers a new—and risky—interest in pre-Columbian art. Wilson’s murderous adventures continue, again woven around the island’s rich history. Wilson objects when his new chief volunteers him to be a member of a joint task force, but he finally gets to meet the Man in Green, and it is not love at first sight. The book was written by David Tuttle, lead writer of the first Wilson Mystery, and edited by Cara Curtin. 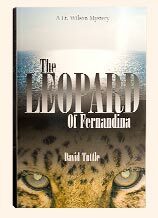 Lieutenant Wilson wants to escape Miami and its high homicide rate, so he takes a job heading the Investigations Division at the Fernandina Beach Police Department. His first day on the job proves to be pure murder, and soon the lieutenant is caught up with treasure maps, a beautiful redhead, and some of the island’s more colorful characters. 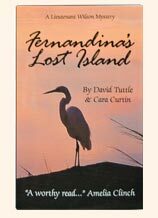 Readers also get a peek into Fernandina history and its notable inns, homes and churches.